Wife, mother, writer; order changes depending on the demands and the day, how nicely I'm asked and the proclivities of individuals involved. I see Mum gazing at my books, my house is stuffed full of them - from mum, from my grandmother - a nine foot tall bookshelf teeters in a hallway, dredged in memories and dust (and happily too high to reach it's summit to do any cleaning). Her fingers lightly trace spines, as if she might suddenly pluck a title to read. But she won't. Because she can't. It is a peculiar thing, teaching an adult to read. More peculiar still when the adult you're teaching is the one that taught you. I watch her staring at her iPad, struggling to make sense of an email. I register the concentration in a creased brow and occasional clucks of irritation. She could resort to the text to speech option but she won't. She may have forgotten it's there to use, but more likely she doesn't like the robotic voice which has no comprehension of grammar so that sentences run confusingly on and long. And it hasn't got a clue about African pronunciation; nothing sounds right. Every place sounds even more alien. I speak to Dr L at UCL, a preeminent doctor in Mum's condition. He explains that we - readers - don't have to break down words, we see the word CAT as a visual object so that our recognition of it is swift and whole and automatic, but mum's condition has robbed her of the ability to see it as a visual which is why she has to break it down into its component parts - C-A-T. He tells me he sees one patient a year with Mum's Pure Alexia - being able to write but not read; it's rare, he says. 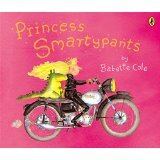 Tired of the Apps, I dig down low and deep in that nine foot bookshelf, crouched on the floor, and I unearth Babette Cole's Princess Smartypants. It is one of hundreds of books Mum sent to my children when they were small. And curled up on a sofa with tea, she reads it to me, faltering over long words and laughing. Reading, no matter what you read, ought always be a thing of joy. It's important to remember that. It's especially important now.